There’s a great article in the October issue of Los Angeles Magazine about the trials and tribulations of the taco truck business. 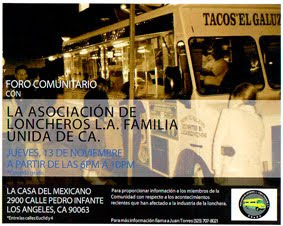 The article focuses on one man and his entrepreneurial spirit to start his taco truck operation. The man’s name is Jesús and his truck is a family affair. The truck’s name is tacos Jeesy’s. Jesús originally planned to name the truck Tacos Jessy’s but the artist he hired to paint the mural made a boo boo. No biggie said Jesús, tacos jeesy’s will do. It was a cool thursday evening when I went looking for tacos jeesy’s and about 6pm when I hit the slow grind of rush hour traffic through the festive streets of Cesar E Chavez blvd. I passed the famed La Parilla,cincos puntos, al pastor carts and an armada of taco trucks and wagons. But my goal was tacos jessy's and as traffic opened up I roared past the Evergreen Cemetary with anticipation and an empty belly. The taco truck landscape continued to reveal itself. Taco trucks at almost every corner, down side streets, one even parked in the driveway of someones home. The taco culture thrives here where taco loyalties run deep. If you’re caught eating at a rival taco truck you’re local taquero will know about it. Coming down the hill another taco truck came into view and I got the feeling this could be it. That feeling was confirmed when I saw the Legand of Volcanoes mural described in the LA magazine article and the name tacos jessy's. As I walked up to the taco window several empty chairs were set along a sleek aluminum counter.An ice compartment of mexican sodas as well as a large glass jug of horchata was visible. I ordered suadero, asada and al pastor and an horchata. The al pastor cut from the vertical spit sizzled on the grill next to corn tortillas and stacks of carnes braising in a hupcap like cylinder grill. I watched as my tacos were topped with onions, cilantro and a ruby red salsa roja. I dug in to the al pastor, the succulent strips of charred pork were deliciously spiced and the flavorful salsa kicked in to provide that extra punch. It was everything you'd expect from great al pastor,it quenched the taco craving, pacified an empty belly. Next up was the carne asada. The braised asada came lean and mean with a beefy aftertaste. 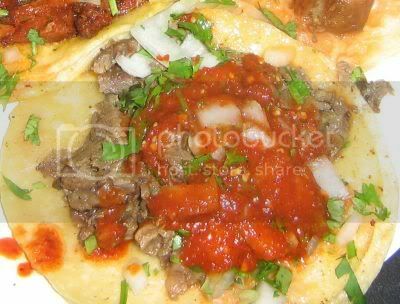 The quintessential LA taco, a perfect balance of greasy beef and spicy salsa. The bold flavors of the salsa roja were prominent ,the spicyness slowly building with every bite until it started to hum on my lips. But it was the suadero that made me close my eyes and thank the taco Gods. 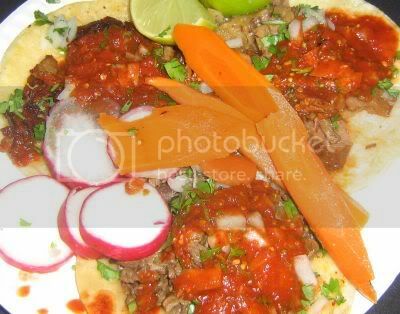 The soft and silky texture of the rib meat melted on my tongue, the taste explosion filled up my cheeks and I stopped to ponder...have I ever had a taco as tender as this? These tacos were excellent and I encourage everyone to pick up the October issue of Los Angeles magazine. The article is very insightful and I must give props to it’s author Jesse Katz for being on top of everything from the new anti-taco truck ordinance to the importance of the taco truck culture in Los Angeles. Thanks for the review. I read the article as well, and I fully recommend it to everyone out there. And thank God his tacos are good! Thanks for another great find. Do do know the hours of operations for Tacos Jessy's? Love your blog, Bandini! What a great, uh, public service. I've recently started my own LA food blog, and have linked to yours since I enjoy it so much. Cheers! Bandini, bout time you got yourself into East L.A.! This is Taco Nirvana. sheacna@yahoo.com. If you don't mind forwarding me the link. Shea, I don't think the LA Magazine puts their articles online all the time-- I couldn't find it either. Go to a library. They have books AND magazines. Wow, huh? After reading this post, I rolled over to Taco Jeesy's. I sampled a few of their tacos and they weren't great but definitely not bad. The al pastor spit was not in use which was kind of a let down. The asada seemed to be boiled instead of grilled which I thought was weird. For a dollar a taco this is definitely worth it but I would not give it a 4 taco rating.